There are as many ways to structure a garden as there are different types of gardens themselves. One form of gardening that is becoming more popular is raised bed gardening. Raised bed gardening consists of planting in elevated beds of soil, whether in large planter boxes, or even bigger areas you construct yourself. 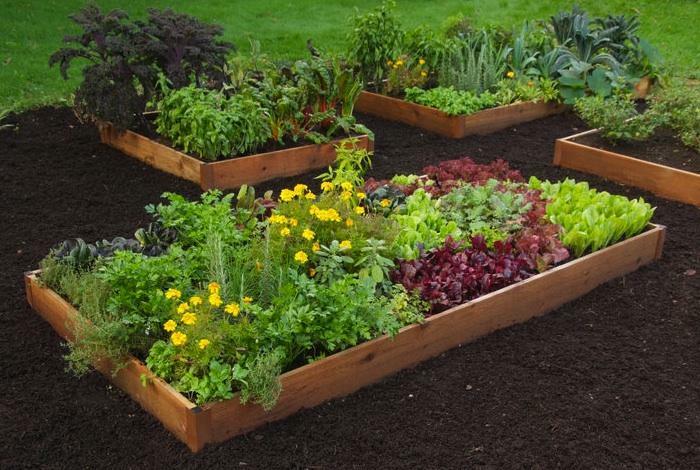 Raised bed gardening has many advantages, and a few disadvantages as well. A review of the pros and cons can be helpful in deciding if this type of gardening is for you. 1. If you have poor soil, raised bed gardens allow you to prepare your own rich mix of soil above ground for growing your plants. 2. Your gardening areas will be easier to access because you won’t have to bend over as much, thus reducing fatigue and injury to the knees and back. 4. Plants are easy to keep organized. For example, you can plant tomatoes in one elevated section and peppers in another. 5. Dead leaves and other garden debris will be confined to their own area, helping you maintain a tidier look in your yard. 6. You can prepare special beds of soil tailored to various plants. For example, plants that need a highly acidic soil can be grouped in one area, and you can prepare the soil to the right pH specifically for their needs. 7. In heavy rains, there is less chance of soil erosion. 8. Rabbits, moles, and other garden pests are less likely to be able to access your plants. 9. Raised bed gardens are ideal for longer rooted crops such as carrots that need several inches to a foot of good quality soil. 10. Raised bed gardening is a great option if you have very little space. Elevated planting areas can even be constructed on a small deck or patio area for growing a collection of herbs, vegetables, or flowers. 1. Any tilling will probably have to be done by hand. It’s difficult to use tractors or rotary tillers in elevated planting areas. 2. The initial up front cost of constructing raised bed gardens is more expensive than simply tilling a traditional garden into your soil. However, kits can be purchased online that make the construction process faster and easier. 3. The edges or borders of the planting areas must be well reinforced during the initial construction, or they may begin to break down over time, creating and ongoing maintenance issue. 4. If you live in a very dry climate, raised beds will dry out faster and require more frequent watering. On the other hand, if you live in a very moist climate, your plants will be less susceptible to root rot from over watering. 5. Elevated planting areas are not suitable to vining or sprawling plants such as pumpkins, squash, watermelons, or various climbing plants such as morning glory, clematis, or trumpet vine. 6. The materials used for constructing raised bed gardens should be carefully considered. Treated lumber or railroad ties soaked in creosote should not be used. These chemicals will leak out into the soil over time, poisoning and killing your plants. Putting in raised beds can be a big investment in time and money, but it will also pay you back in better plants, more gardening room, and easier access to your gardening areas. A careful evaluation of all the pros and cons will help you make the right decision for you and your yard. Whatever your decision, careful planning is always the key to successful results in the garden.